Perfect size for my application which was recessing the sink into the quartz countertop-good quality, nice looking, very pleased- highly recommend. I added a water fall faucet along with a ceramic popup for the sink and have had several thumps up from friends for an inexpensive bathroom update. Give your restroom furnishings a bold new look with this Dawn above-counter square vessel sink. 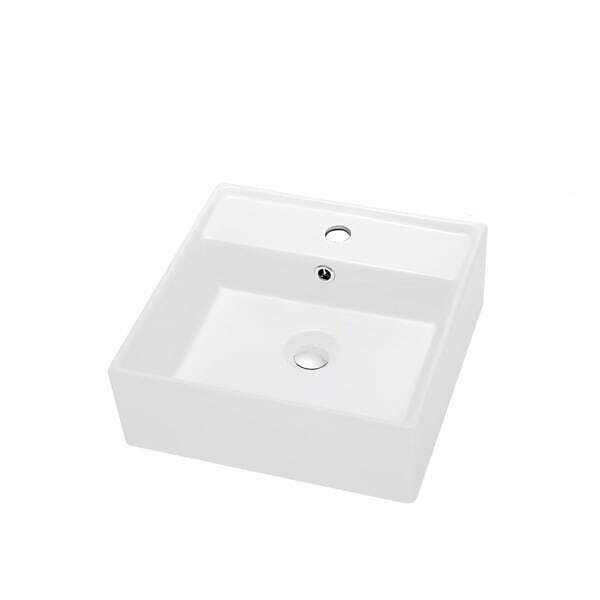 This handsome sink is made of a durable ceramic in a smooth white coating for a modern appeal. This sink is designed with an overflow, single faucet hole, and center set drain hole for your convenience. Purchased this sink for my powder room. I installed on a 24 inch vanity. The size is just right. The quality is very good. and you can't beat the price. "Do you have a oil rubbed bronze drain stopper for this sink?"